The oversaturated advertising Mecca of New York’s Times Square has been transformed into a hotspot for political commentary with the art project Word on the Street (until February 2018), which shows text-based works by an all-female roster: artists Carrie Mae Weems, Wangechi Mutu, and Amy Khoshbin with the writer Anne Carson. 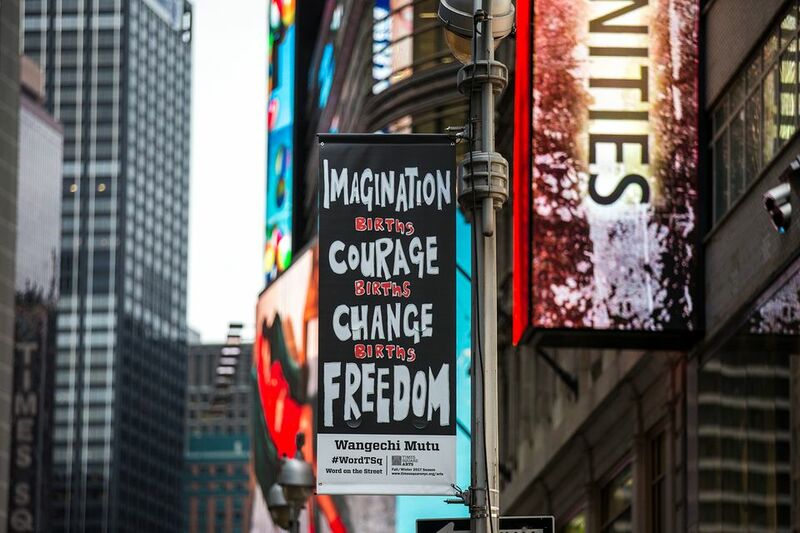 The works, displayed on pole banners and trash and recycling bins, respond to contemporary issues including women’s equality, white supremacy and the refugee crisis, and read like empowering rallying cries, such as Mutu’s “Imagination births courage births change births freedom”. “I hope that people will be jarred out of the hypnotic inundation of branded signage and imagery we see all around us, especially in Times Square,”says Khoshbin. Word on the Street has been organised by House of Trees, a contemporary art collective Khoshbin leads with her siblings Jennifer and Noah, and is commissioned by the public art programme Times Square Arts. It is part of a larger eponymous initiative, which originated with banner-making for the Women’s March in January, when House of Trees asked the writer Anne Carson for short phrases to turn into felt banners. One of the phrases, “Action comes from the backbone not the wishbone”, is on view in the Times Square show. New works include printed copies of felt banners that were designed by Weems and Mutu and made in Texas by female refugees, who are “getting paid to make objects of resistance”, Khoshbin says. “We value these women, their hard work, their importance in our country, and we want to help support them in an increasingly hostile cultural landscape as we see policies like DACA being repealed.” President Donald Trump announced on 5 September his plans to rescind DACA (Deferred Action for Childhood Arrivals), an executive order issued by President Barack Obama that allows the children of undocumented immigrants to avoid deportation and legally apply for work permits. Amy and Jennifer Khoshbin are encouraging public involvement with Workshop on the Street, due to be held on 7 September in two time slots (12pm-1pm and 6pm-9pm) at Broadway Plaza. They will be helping people to make wearable protest art, such as sashes, badges and capes, from felt and glue, which will be provided. Khoshbin says that, while she has been hosting workshops at art institutions, “it’s not just about the arts community. Times Square has the power to activate participants from different viewpoints from all over the world”. “I hope with Word on the Street, we can instigate a cultural dialogue around the resistance movement and we can be empowered to action through creative response, hope, and a focus on intersectionality,” Khoshbin says.